The interconnectivity of surface and groundwater supplies is well documented and understood. However, Texas water law generally fails to adequately recognize this concept, and the state’s planning and management processes frequently treat groundwater and surface water separately. Given the increasing pressure on Texas water supplies, it is time for key water planning processes, including State and Regional water planning, Groundwater Management Area planning and the Environmental Flows process to better account for this interconnectivity. 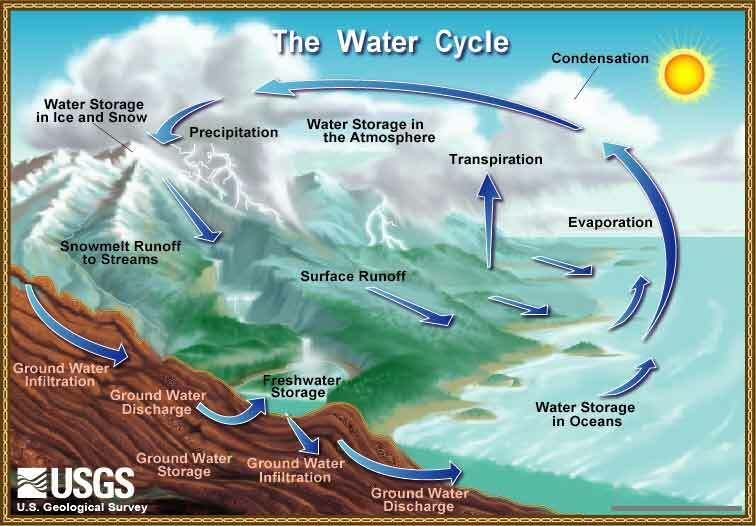 The water cycle, which includes both surface and groundwater, is a dynamic and interconnected system. In many instances, surface water, which includes water flowing through our creeks, streams, and rivers, originates below the surface. More research is needed across the state to completely understand the degree of interconnectivity of our water resources. However, in some areas, the fact that our surface water resources are highly dependent on the underlying aquifers (and vice versa) is well understood and documented. 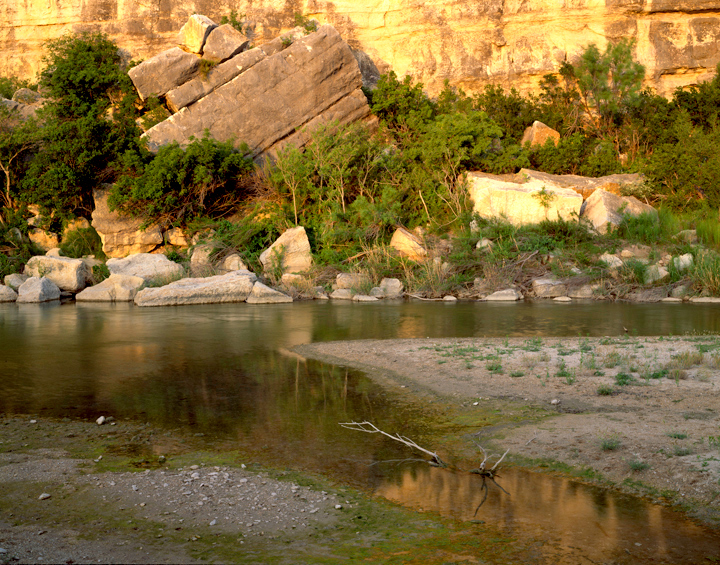 The influence that spring flows have on creeks and rivers is strongly evident in the Hill Country and the Edwards Plateau, where groundwater pours out of the Edwards-Trinity (Plateau) Aquifer through springs to form the headwaters of the Pecos, Devils, Nueces, Frio, Sabinal, Medina, and Guadalupe, Llano, and San Saba Rivers. Springs and other natural discharges of the Trinity Group Aquifer supply additional water to most of these rivers as they flow east and southeastward across central Texas towards the coast. Natural discharges of the Trinity Group Aquifer also form the headwaters of the Pedernales and Blanco Rivers. Especially during periods of low rainfall and minimal surface runoff, spring flow from the underlying aquifers is the life support in maintaining surface flows – like rivers – throughout the state. For example, spring flow from the Edwards Aquifer in Hays and Comal Counties becomes almost the sole source of downstream water flows in the Guadalupe River during droughts. On September 5, 2006, during a very dry period in Texas, USGS data show that spring flows from Comal and San Marcos springs accounted for 86 percent of the flows of the Guadalupe River at Victoria. Farther west, up on the Edwards Plateau, USGS stream flow data collected during the summer of 2006 show that the flow of the spring-fed Llano River accounted for approximately 75 percent of the water flowing into the Highland Lakes, which provide water for the Austin area and downstream. 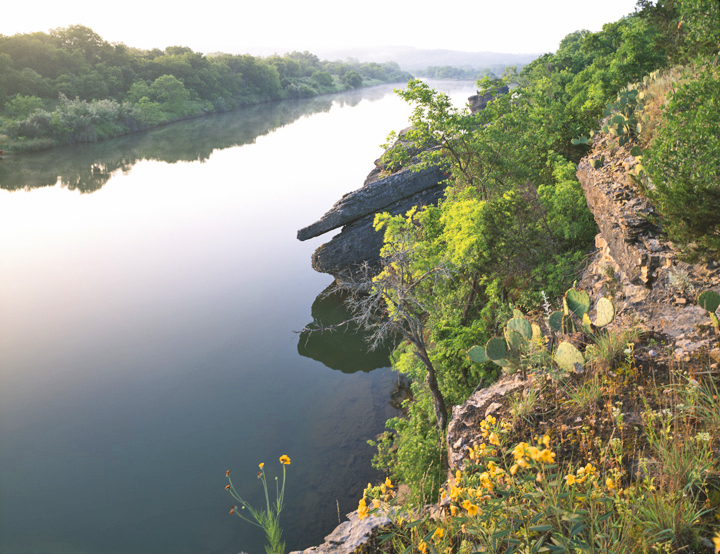 The United States Geological Survey conducted a gain-loss study and an analysis of historical streamflow measurements for the Brazos River reaching from McLennan County down through Fort Bend County. Based on both the current study and the historical data, there is an appreciable increase in flows of the Brazos River as it trends southeast across the Falls County line towards the city of Bryan. Underlying that reach and supporting the flows of the Brazos are the Carrizo-Wilcox, Queen City, Sparta, and Yegua-Jackson Aquifers. From the measurements collected in 2006, a section of the river traversing the Yegua-Jackson Aquifer outcrop gained 258 cubic feet per second (cfs) in March, which accounted for approximately 30 percent of the measured river flow at that location. In August, another section flowing over the Carrizo-Wilcox Aquifer outcrop gained over 194 cfs, accounting for approximately 33 percent of the total flows. Natural discharges from the Northern Ogallala Aquifer support the flows of the Canadian River as it traverses the Texas Panhandle. In the eastern portion of the Texas Panhandle where the Ogallala Aquifer has not been excessively dewatered, it also discharges to a variety of smaller streams and rivers within the Canadian River Basin. In Hemphill County, for example, numerous tributaries to the Canadian River, including the Washita River, Red Deer Creek, and Gageby Creek among others, all reportedly flow continuously even through drought periods due to natural discharges from the Ogallala Aquifer. While two separate legal regimes regulate the management and use of groundwater and surface water, there is some recognition in the Texas Water Code that the use and availability of one resource affects the other. For example, the Texas Commission on Environmental Quality is directed to consider the effects of granting a surface water permit on groundwater and groundwater recharge. In turn, when groundwater districts evaluate groundwater permit applications, they are directed to consider whether the proposed use of water unreasonably affects existing groundwater and surface water resources. Groundwater districts must also coordinate with surface water management entities when developing their management plans. Unfortunately, implementation of these directives is often inadequate. Protection of surface water flows and existing surface water rights should be a much more integral component of groundwater availability discussions in the Groundwater Management Area process and in groundwater district decisions. This means, at a minimum, more active participation by surface water interests in the Groundwater Management Area process and groundwater district decision making. Additionally, explicit consideration of spring flow contributions to surface water flows, where they occur, should be considered in development of strategies for meeting environmental flow recommendations under Senate Bill 3. The Texas Water Development Board and the Texas Commission on Environmental Quality should work together to develop standard protocols that guide the incorporation of surface and groundwater resource data into the surface Water Availability Modeling (WAM) and Groundwater Availability Modeling (GAM) analyses. The agencies should also ensure that these and other water resource modeling tools accurately reflect the interconnectivity of the resources to the greatest degree possible given currently available data. With assistance from the legislature, the Texas Water Development Board and the Texas Commission on Environmental Quality should prioritize state funding for developing better science in areas with a strong degree of surface and groundwater interaction, including conducting streamflow gain-loss studies where adequate data are lacking and increasing long-term monitoring of spring flows.